The Paleolithic Age (up to 10,000 BC) of human evolution is characterized by the ability to use stone tools and a primitive society centered around small groups or bands. The humans of this age were hunter-gatherers and lived in primitive accommodation such as caves and rock-shelters. In more ways than one, these ancestors of ours were directly dealing with the (perceived) whims of nature. The tools of this age have been found by archeologists after considerable efforts and excavations. 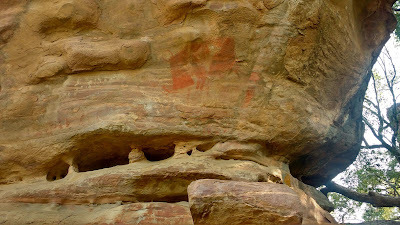 Their life-accounts, however, have been preserved in the form of paintings and murals which have survived to this date. These paintings tell tales of warriors, of festivities, of hunters and the hunted and a lot more. A downside of all this is that it has inspired modern technology companies to document every minute thought that an engineer thinks of thinking about! 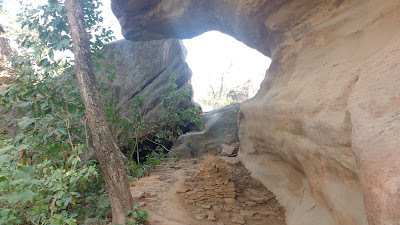 The Bhimbetka (or Bhim-Baithika, seat of Bhim) Rock Shelters are a group of fifteen rock shelters occupied by humans in the Paleolithic age. 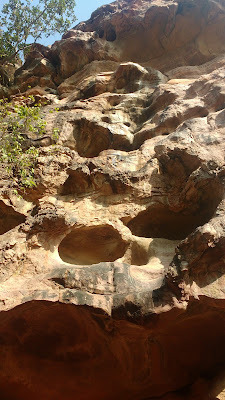 All of these are located near the top of a rounded hill in the ageless Vindhya Range over a distance of about 800m. Some of the shelters are just that, while some others have paintings. 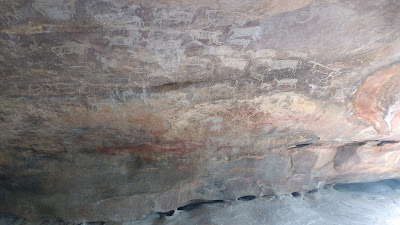 The paintings date from Paleolithic age of hunters-gatherers to a much modern age of kings and armies. 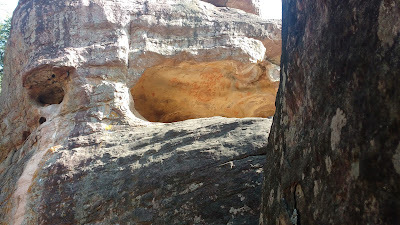 There is an important distinction between a rock-shelter and a cave though - these shelters are mostly open from two or more sides and have a scarp of protruding rock overhead for protection. Some of these are small enough to shelter not more than a couple, while some are large enough to shelter a band of twenty. 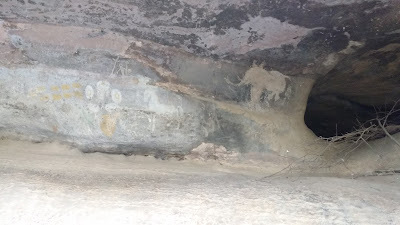 The Bhimbetka Rock Shelters are included in the UNESCO list of World Heritage Monuments since 2003. The course of introduction to Paleolithic life begins here. This shelter has modern sculptures of a small Paleolithic family going about their daily chores. 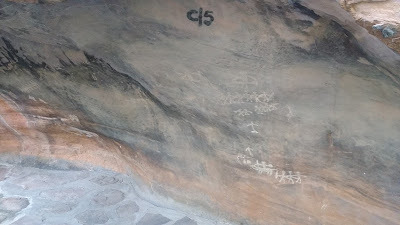 Next to it is a pit - about 3m deep - with a board indicating the different stone formations and associating them with various ages. This is more of an educational shelter. 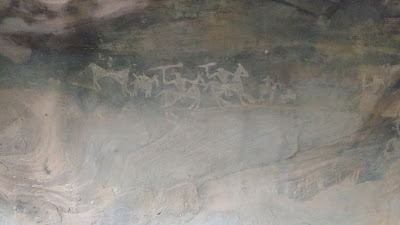 This shelter has small paintings of elephants, their riders and what looks to be a hunting scene. Open on both sides, but continuous cover on top. This one has a unique imprint of a child's palm and a few cupules. It also has a natural seat-like structure which has been sat on by countless modern unconcerned visitors. 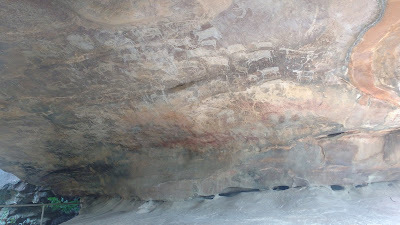 One of the best shelters in terms of paintings - this one has 453 of them! There are 262 animals of 16 species, 90 humans, 1 bird, about 100 odd designs and figures and one inscription in Shankha script. There's also a royal procession shown here. There is a view point after this shelter. The views are expansive on one side, but still restricted due to the jungle on the northern side. These three shelters open up to one another. There is a huge crawlspace here, along with multi-level shelters and galleries. This shelter is nondescript, except for the rots of a Papda tree that extend all the way from top to bottom of the shelter. This shelter appears from away to resemble a toad. This features a large boar being attacked by small humans (or the other way around). 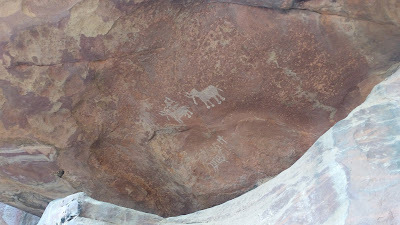 These shelters are located on the return path and feature beautiful paintings of human-animal interaction, a hunting party, people gathered together and a dancing lady. 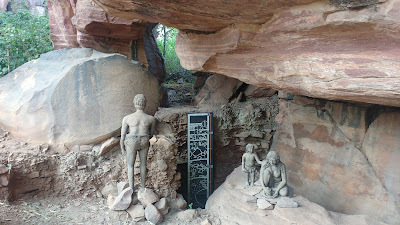 Up the road from the main Bhimbetka complex is a small temple built out of a rock-shelter. 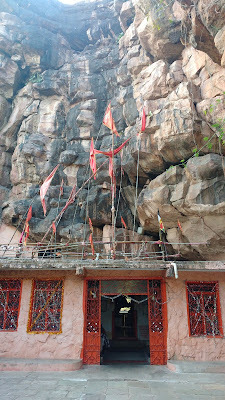 The temple is frequented by locals and also has a resident sadhu. 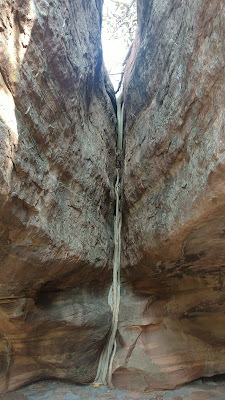 This is the resort run by MP Tourism that is located at the main highway indicating the fork to Bhimbetka. The place has a restaurant with a set menu, but excellent food quality. 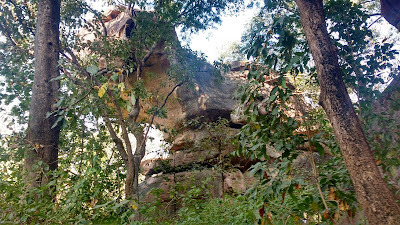 Bhopal, about 50km north, is the best point of entry for Bhimbetka. Local buses plying the route from Bhopal to Hoshangabad or Pipariya will drop off at the Highway Retreat resort. 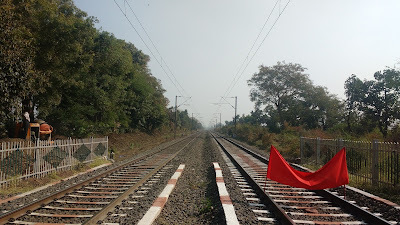 A road across the railway lines takes one to the ticket counter after 1km. 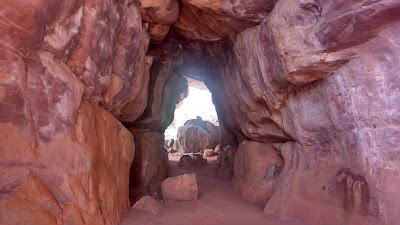 The entry ticket for Bhimbetka is INR50 per head. 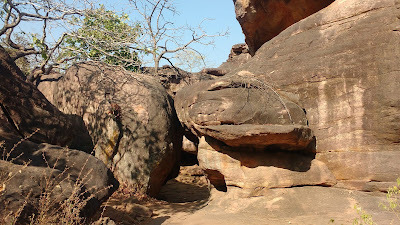 A further uphill road of 2km separates you from Bhimbetka. A rickshaw might be awaiting at the counter if you are lucky, else a walk takes about 20mins. Amazing site !! we would visit this place very shortly and I think your post will help us a lot ! !